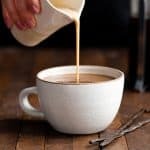 Homemade Healthy Coffee Creamer Recipe (Paleo & Vegan)! A 4 ingredient, easy recipe that's SO MUCh healthier than store-bought creamers! Dairy-free, refined-sugar free, paleo, and vegan! Shake up a can of coconut milk then pour it into a small saucepan. Add 3 TBS coconut sugar & a pinch of salt, whisk to combine. Cook over medium-low heat until the mixture just starts bubbling and sugar is dissolved (don’t let it boil or you’ll have a coconutty mess all over your stove)! Cut the vanilla bean in half lengthwise and scrape out the seeds. Add seeds to the milk mixture and stir. Put the whole vanilla bean into the pot and cover with a lid. Let the mixture sit for at least 30 minutes, or until cooled to room temperature. Using a fine mesh strainer, strain your creamer as you pour it into a glass jar. Discard beans. Store in a glass jar with a lid in the refrigerator! Give it a shake before adding it to your favorite coffee! *If you don't plan on using the entire batch of healthy coffee creamer within one week of making it, you can freeze it to use later! Simply pour the coffee creamer into an ice cube tray and freeze. Then remove cubes and store in an airtight container/ziploc bag in the freezer. To use, place a cube of creamer in your coffee mug and warm in the microwave. Then stir in your favorite brewed coffee and enjoy!